These medium-sized breakers are engineered with a higher back head pressure and larger pistons for an increase in impact energy. 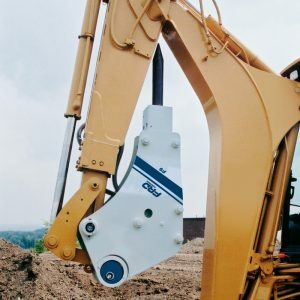 F6 and F9 rock breakers are available with FRD USA’s unique Switch Hitch side plate mounting system for rubber-tired backhoes. An indexing disc inserted in the side plate can be easily changed to accommodate quick couplers for many popular backhoes, including Case®, John Deere® and Caterpillar®. Attachment is as simple as rotating the disc to the OEM center dimension of the carrier then attach the hammer in the normal manner. There’s no need for separate OEM specific mounting brackets for each carrier. This design also increases tuck for better over the road transport and aids in loading and unloading of the equipment. The F6 and F9 also come in the popular Qt version to accommodate work environments that demand a reduced noise level. The F6 is available with a one-piece skid-steer loader bracket for large series skid-steer loaders. All FRD USA hammers come complete with our exclusive Pro-Pak for ease of installation. The Pro-Pak includes hose whips, mounting hardware, standard working steel and tool kit with operating manual at no additional charge. 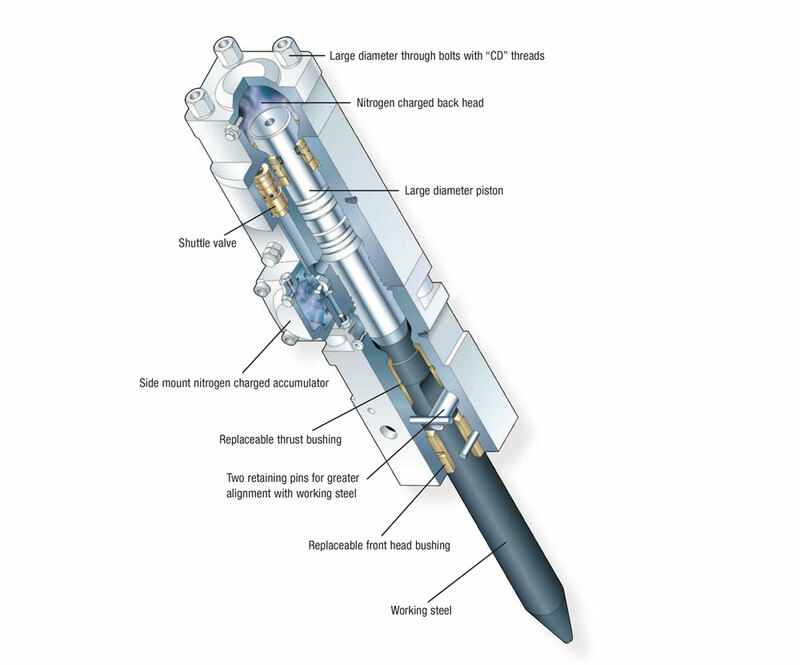 Increase in back head pressure and larger diameter piston results in greater impact energy. Longer thrust bushing improves piston alignment during impact and incorporates grease holes to evenly distribute grease in the front head. 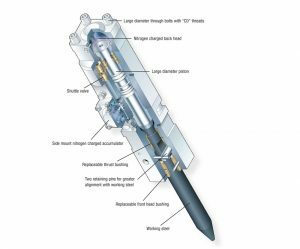 CD designed side bolt threads provide even load distribution and greater surface contact between the nut and the bolt reducing the chances of thru-bolt failure. Increased front head wall thickness for added service life. Nitrogen charged back head for superior energy transfer. Large diameter piston for increased impact energy. CD designed threads on thru-bolt provide even load distribution and greater surface contact between the nut and bolt. New front head design includes replaceable thrust bushing for added service life.